Venmar air exchangers employ advanced technology to efficiently expel excess humidity, reduce gaseous pollutants and bring a continuous supply of fresh outdoor air into the home. Only an air exchanger can perform this task. It is important not to neglect the impact of an unbalanced ventilation system. If an air exchanger unit does not expel and intake equal amounts of air, a negative or positive air pressure imbalance occurs. Venmar air exchangers are factory balanced. This means when installing these units following the installation instructions, there is no need to balance them. All other units must be balanced by an HVAC (Heating, Ventilating and Air Conditioning) professional. Balancing is required on all units unless specified otherwise. When it is Hot and Humid, the Quattro limits the amount of heat and moisture entering the home to optimize comfort, enhance energy efficiency and reduce strain on air conditioner. When it is Hot and Dry, the Quattro recovers moisture to maintain proper humidity levels inside, keeps heat from entering the home and reduces strain on humidifiers. When it is Cold and Dry, the Quattro recovers heat and moisture to optimize energy recovery, eliminates drafts, thereby reducing strain on humidifiers. Combine an Air Oasis Induct Air Purifier with a Venmar Ventilation System (or any HVAC system) and get the ultimate in pure air in your home. The Venmar Air Exchange System is fabulous for recovering heat or energy, providing fresh air, controlling humidity and removing particulate (dust, pollen, dander, etc. ), but by adding the powerful broad-spectrum pollution purification abilities of an Air Oasis HVAC Induct Air Purifier, you get the ultimate in whole-house clean air. Air Oasis air purifiers destroy bacteria, viruses, pesticides, herbicides, mold spores, chemical fumes and gases, VOCs, odors and more from your ductwork and every room served by a vent. The residential and business HVAC (heating, ventilation and air conditioning) induct models are designed for use with forced-air heating and central air conditioning systems (HVAC) to purify the air in all rooms served by ductwork in small to large single-family homes and office buildings. Turn your central heating and cooling system into an air-cleaning machine to significantly reduce pollutants and contaminants in your entire home or business. 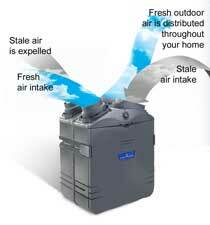 For more information, see the Air Oasis Air Purifiers.